This piece is really closed to my heart, and possibly one of my favourites of those that I have completed. I designed this pattern for a very special lady in my fitness group, who has gone through, and will continue to go through hard times in the months ahead. I designed it as a reminder that she is loved by all those around her. That she has the support of many people, who are all here for her and her family and whatever they may need. Mrs L is loved by everyone who meets her. She genuinely cares and loves all those she meets, and would do anything to help you if you needed support, help, or a hug. Her favourite colour is green. At fitness, we all know to leave the green mats for her, so my design was inspired by this. 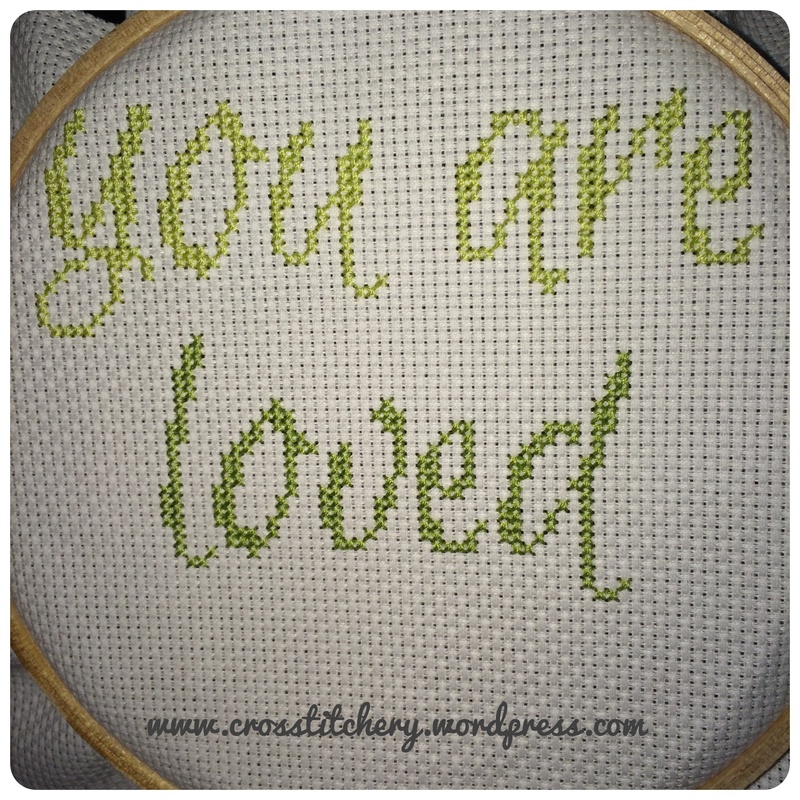 I decided to start with a light green for the, ‘you are,’ words, and move to a slightly darker green for the, ‘loved’ word. The dark pink, mid pink and cream details contrast really well I think with the green. 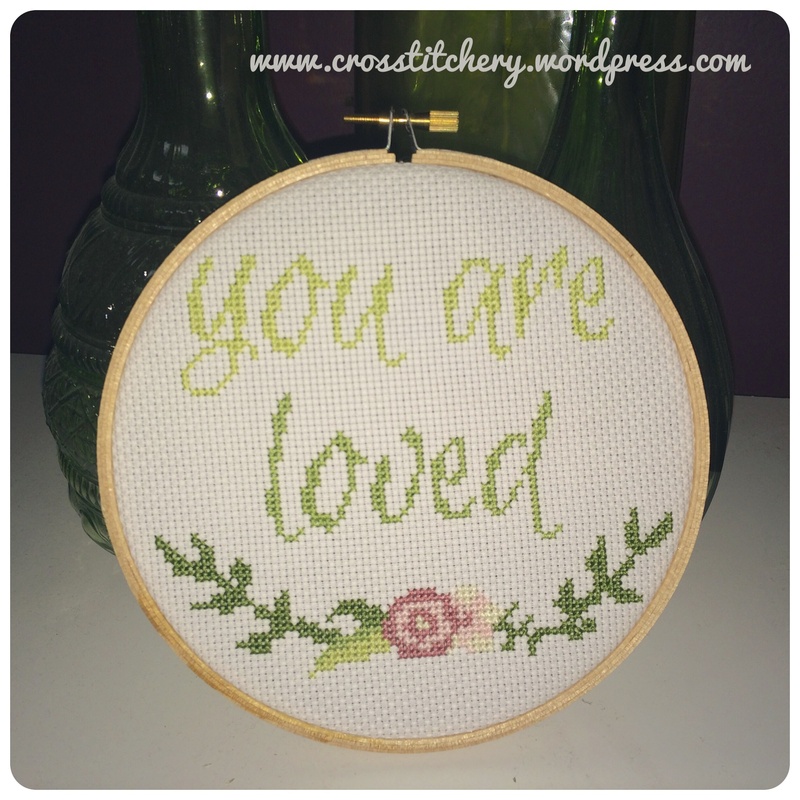 I’ve framed it in the hoop, as I think it works perfectly in there, and Mrs L can hang or keep it wherever she likes. I hope whenever she looks as it she is reminded of the love and support surrounding her. That’s such a nice idea :) And yes, it certainly does fit very well in the hoop- I though that you;d designed it to go in there! Such a happy coincidence!